Hey Google, why is my boss a control freak? 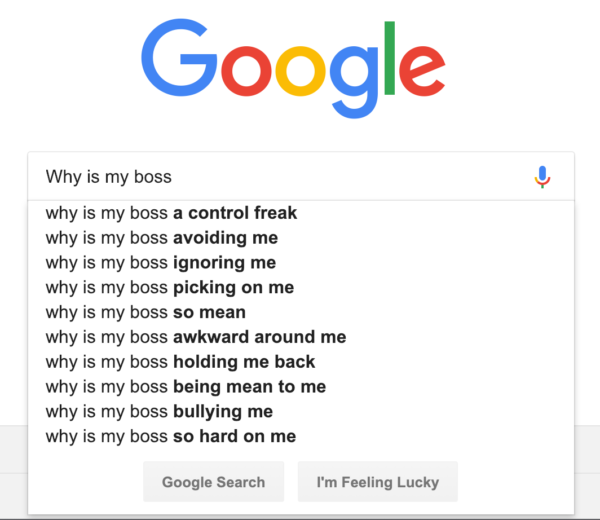 At a conference last week, I asked over 100 leaders to open Google on their phones and type in “Why is my boss” and see how Google auto-completes the question, based on the searches of thousands of other users. As you can see from the screenshot below, the answers prompted a lot of laughter and debate! There’s also a serious issue here about the behaviour of those bosses who exhibit toxic behaviour. Not only does this cause a lot of stress and suffering, it also leads to poor economic outcomes, with some research suggesting that bad bosses hit productivity by around 50%.